Hybrids are known for getting good gas mileage and there aren't many that can compete with the 2018 IONIQ. This masterpiece of engineering has garnered the ability to reach an amazing EPA rated 57 mpg in town and 59 mpg on the highway. This type of fuel efficiency is accomplished without the need for battery charging or any alteration to your driving habits, so you can hit the streets of Grand Rapids without worry. 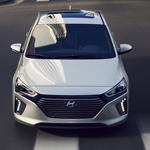 When you visit Fox Hyundai for a closer look at the Hyundai IONIQ, you'll also find other benefits that drivers can take advantage of. These include a smoother ride over uneven ground. This is accomplished through a multilink rear suspension that gives you better control and stability when the road is uneven or when it curves.